Axair were recently tasked with finding an air movement solution for a major producer of throat and cough sweets. The customer, with a site based in the centre of a rural town, employs more than 200 people and was established over 200 years ago. 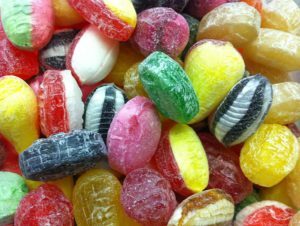 A review of the company’s manufacturing processes revealed that the method of producing throat lozenges, using a powered starch mold process, has the potential to cause an explosion. Starch powder, like many food based powders used in the food processing industry, has the potential to be explosive. The conductive and combustible nature of the powders or grains used in the process means that there is a risk of catastrophic explosion, as even a small explosion could cause more powder to become air born and in turn ignite. Following a full site survey undertaken by a risk assessor, Axair were invited to visit the site and make recommendations for fans to be used in the drying and preparation rooms of the customer’s products. One of Axair’s product sales engineers specifically trained in ATEX (Atmospheres Explosibles) fan specification made the visit. To find out more about the ATEX directive, click here. During the site visit, it became apparent that the existing fans installed in six different drying rooms were not ATEX certified and not working to maximum efficiency. Banks of 10 or 12 fans were pulling air through a false ceiling that recirculated dry warm air through the room. It was noted that the fans used were installed to run in a reverse airflow and therefore not working efficiently in the system. Axair’s solution was the HJBMX-30-M4-0.9KW-XD single phase ATEX fan suitable for handling dust from supplier, Casals. 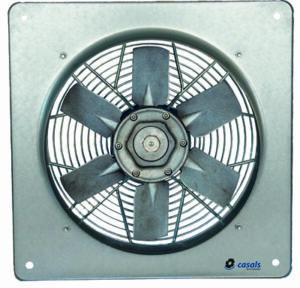 When installed in the correct orientation and running in an efficient airflow direction, the new fan not only offered compliance to the risk assessor’s ATEX recommendation but also supplied increased airflow at lower running costs. Furthermore, the risk of paint contamination was removed as the fan supplied was produced in stainless steel. Axair have since supplied in excess of 70 fans to this site and received positive feedback on their performance. Contact us on 01782 349430 or sales@axair-fans.co.uk for more information or to specify an ATEX fan suitable for your application. Please note prior to fan selection: if you are not sure whether you need an explosion proof ATEX fan or need to know the zone in which your application is classified, please consult an official authority in your country. This entry was posted on Monday, April 9th, 2018 at 10:39 am and is filed under Applications, Industry, Products. You can follow any responses to this entry through the RSS 2.0 feed. Both comments and pings are currently closed.